International Committee of Medical Journal Editors. Recommendations for the conduct, reporting, editing and publication of scholarly work in medical journals. http://www.icmje.org. Accessed: October 1, 2014. 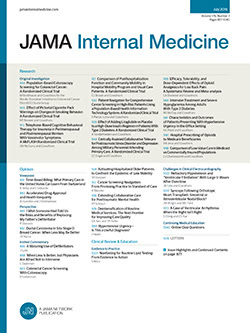 Employees of industry coauthor clinical studies published in academic, peer-reviewed medical journals.1 Although the practice remains controversial because of perceived conflicts of interest (COI),2 the association between industry-employee authors (IEAs) and trial outcomes remains poorly characterized. Clinical trials in interventional cardiology have substantial industry involvement and afford opportunities to explore the impact of IEAs. We reviewed studies of devices used in interventional cardiology to examine authorship by industry employees and its association with published study outcomes. We searched PubMed for all prospective studies of cardiovascular devices published between January 1, 2010, and December 31, 2012, in 9 journals that publish a large number of trials in interventional cardiology. Studies were included if they evaluated the clinical performance, efficacy, or safety of specific devices used in interventional cardiology in adult humans. Primary and major secondary reports and substudies of randomized clinical trials (RCTs), first-in-human studies, early feasibility studies, and registries, including prospective cohort studies, were analyzed. Studies evaluating general management strategies were excluded. Published author affiliations and disclosures were reviewed. For the investigational device that it examined, a clinical trial was classified as positive, negative, or neutral with respect to the prespecified primary study end point. Outcomes of registries and early feasibility studies were classified on the basis of the reporting authors’ interpretation of the study data. Two of us (N.R.S. and A.P.) independently evaluated study outcomes, and a third (G.W.) adjudicated disagreements (in 10.4% [37 of 357] of the studies evaluated). Multivariable binomial logistic regression was used to identify study attributes independently associated with outcomes. All statistical analyses were done with SPSS, version 20 (IBM), with significance defined as P < .05 (2-tailed test). Among 18 658 published articles, 578 studies evaluated interventional cardiology devices, of which 357 met the full inclusion criteria; 78 (21.8%) listed 1 or more IEAs, and 170 of the authors (4.0%) reported industry employment. The characteristics of the included studies are summarized in Table 1. Forty manuscripts (11.2%) reported 2 or more IEAs, and 22 (6.2%) reported 3 or more IEAs. Among 153 articles describing RCTs in which interventional cardiology devices were studied, 41 (26.8%) had 1 or more IEAs. Studies that were industry funded, had a funding source in the United States, or reported registration with clinicaltrials.gov were more likely to have 1 or more IEAs. Positive study outcomes were reported in 287 of the 357 (80.4%) articles included in the review and in 102 of the 153 articles (66.7%) describing RCTs. There was no difference in positive study outcomes in articles with and without IEAs (87.2% [68 of 78] vs 78.5% [219 of 279]; relative risk, 1.11; 95% CI, 1.00-1.23, P = .09). Among articles describing RCTs, those with IEAs were significantly more likely to report positive study outcomes than those without IEAs (87.8% [36 of 41] vs 58.9% [66 of 112]; relative risk, 1.49; 95% CI, 1.23-1.81; P = .001). Among 101 industry-sponsored RCTs, IEAs were also associated with positive study outcomes (87.5% [35 of 40] vs 65.6% [40 of 61]; relative risk, 1.33; 95% CI, 1.07-1.66; P = .01). Industry-employee authors remained independently associated with positive study outcomes (odds ratio, 2.66; 95% CI, 1.10-6.40) after multivariable adjustment (Table 2). In contrast, a similar proportion of articles with any author-reported COI described studies with positive outcomes as did articles without any author-reported COI (80.9% [191 of 236] vs 79.3% [96 of 121], P = .82; odds ratio, 0.85; 95% CI, 0.43-1.71). Employment by industry may be an important COI in academic medicine, but the role of IEAs in the research process is not always disclosed. In some cases, IEAs may be “honorary” authors who have not substantially contributed to the design of the study being described in a published report, to the acquisition or interpretation of the study data, or to drafting or revision of the manuscript and do not meet accepted authorship criteria.5,6 Conversely, many industry employees involved in studies may remain uncredited. Also, industry employees seeking acknowledgment for their contributions may be preferentially interested in coauthorship of manuscripts reporting positive trial outcomes. Ultimately, the full nature of the association between IEAs and the published outcomes of clinical trials remains uncertain. Corresponding Author: Giora Weisz, MD, Department of Cardiology, Shaare Zedek Medical Center, 12 Beyth St, Jerusalem 91031, Israel (giora.weisz@gmail.com). Published Online: March 28, 2016. doi:10.1001/jamainternmed.2016.0367. Author Contributions: Dr Smilowitz had full access to all the data in the study and takes responsibility for the integrity of the data and the accuracy of the data analysis. Study concept and design: Smilowitz, Weisz. Critical revision of the manuscript for important intellectual content: Smilowitz, Weisz. Conflict of Interest Disclosures: Dr Weisz reported serving on the medical advisory boards of Angioslide, AstraZeneca, Calore, Corindus, Filterlex, Medtronic, Medivisor, M.I. Medical Incentives, and Vectorious and receiving research grants from Angioslide, Corindus, and Mitrazyme. No other disclosures were reported.